Copyright © 1995 by Eric M. Jones. In his commentary on the Apollo 17 transcript, Gene Cernan says that, in his experience, landing a jet on an aircraft carrier at night is more difficult than landing the LM. Certainly, in the LM he had plenty of help from Earth; visibility was good; and there were no winds or waves to move the target around. Still, the LM was an experimental craft and the vehicle that Neil Armstrong and Buzz Aldrin landed was only the fourth that had ever been flown. And, of course, no carrier landing had ever had quite the historic overtones of Apollo 11; nor had any carrier landing ever been performed before so large an audience. Literally billions of people listened as it happened. Down to 50,000 feet above the Moon, Apollo 11 was little different from 10. Armstrong, Aldrin, and Command Module Pilot Mike Collins had a flawless launch from Earth, a long, uneventful coast out to the Moon, and a nominal engine burn to put themselves into lunar orbit. As they crossed over the Sea of Tranquility for the first time, Armstrong remarked that "the pictures and maps brought back by Apollo 8 and 10 have given us a very good preview of what to look at here. It looks very much like the pictures; but, like the difference between watching a real football game and watching it on TV, there's no substitute for actually being here." On that first orbit, the planned landing site itself was still enveloped in pre-dawn darkness and it wasn't until their fourth pass - during LM checkout (4.9 Mb movie clip, produced by Gary Neff) - that Aldrin reported seeing it from the LM windows. "When I heard that they were going to target Apollo 10 for the Apollo 8 target site, I went to Tom Stafford and said, 'Tom, you know, this is really not the most efficient way to prepare for Apollo 11. First, we've already seen the Apollo 8 site, admittedly from high orbit (60 miles altitude), and we came away with some confidence that it was acceptable. Second, if we target Apollo 10 for the next certified site west (certified landing sites were spaced about 12 degrees apart - about the distance the sunrise line moves in 24 hours - in case there was a launch delay and you didn't want to have to wait a whole month), the fact that Apollo 10 is going to spend an extra day in orbit means that, by the time you're ready to leave, the Sun will have risen on the third site. So, by the end of Apollo 10, we will have three options for Apollo 11.' That was my basic argument. And Tom liked the idea. "So I worked out more of the detail and began to raise the idea up the chain of command. One of the people we briefed was Jerry Hammack, the Recovery Chief, who was in charge of recovery back here on Earth. We had stuck something in our arguments to get his attention because, had we maintained the Apollo 8 target for Apollo 10, we would have had a pre-sunrise, quasi-nighttime splashdown. And he'd been nervous about that. We didn't know how nervous, but it didn't seem like a good idea to us and, by retargeting to the next site, you ended up with a post-sunrise splashdown in the Pacific. And when we briefed Chris Kraft, the discussion went back and forth and, just as I paused, Jerry said 'All that and a daylight landing, too!' And that impressed Chris and I think he became an advocate then. "But then we took it up to the next level, late one night, to George Low and Sam Phillips, who were in town (Houston), and gave them the whole presentation. And when we left the room, George had indicated that he didn't think it was a good idea. Sam had not indicated one way or the other, but did say that we were just too far down the line to change the data pack. So, when Tom and I left, we were sort of discouraged. But the next morning, Tom called me and said that George had changed his mind. And I said, 'I think Sam Phillips changed George's mind.' But, whatever the reason for it, they said go ahead and target for the next landing site. And that ended up being Tranquility Base. When we got to Apollo 11, there was no question. We knew we had plenty of time after coming around the limb, the tracking had been done (on Apollo 10), and we'd seen the sight close up (from 9 miles rather than 60). And even I couldn't argue that we ought to go further west." Eighty six hours and five-and-a-half lunar orbits into the mission, the crew of Apollo 11 settled down for their last rest period before the landing. As Jack Schmitt relates in his Apollo 17 commentary, six hours of intermittent sleep in orbit can be as restful as six hours of uninterrupted sleep on Earth and, during the outbound trip from Earth, the Apollo 11 crew had been getting between 9 and 10 hours during each of the rest periods. The final rest before the landing was necessarily a short one, but the three of them each got six hours of deep sleep. When the wake-up call - answered by a very groggy Mike Collins - came at ninety-three hours into the mission, they were rested for the historic day ahead. For the next eight hours, Armstrong, Aldrin, and Collins got ready for the descent. By the time they disappeared behind the Moon for the fourteenth time, they were suited and undocked, and just minutes away from the 30-second burn that would put the LM on the Apollo 10 descent trajectory down to 50,000 feet. Collins would remain in a circular orbit 60 nautical miles above the Moon and, because of his higher altitude, it was he who was first to regain radio contact with Earth. Everything had gone well. The LM would be coming around the corner in just a moment and right on time. There were no seats in the LM. Armstrong and Aldrin were standing, held in place by elastic cords attached to the flooring. For sixteen minutes they looked out the windows and timed the passage of landmarks below them (across a scale marked on Armstrong's window) to confirm the tracking data that Houston was getting. With Houston's help, they also checked and double checked the health of the LM. When the twelve-and-a-half-minute descent burn finally began, they had the spacecraft oriented so that they were flying with their feet and the engine forward. They were also flying with the windows facing the Moon so that they could do some post-ignition landmark timing; but then, as planned, three minutes into the burn Armstrong rotated the spacecraft to a face-up position. Now, he and Aldrin needed to fly with their backs to the Moon so that, as they approached the landing site and the LM began to rotate upright, Armstrong would be able to see the ground ahead and pick out a good, clear landing spot. As they flew, they monitored the LM's performance and the readouts of the guidance computer. All of the data indicated that they were flying very close to the planned trajectory. If, as Cernan suggests, landing on the Moon was easier than landing on an aircraft carrier at night, one of the many advantages was the fact that the LM was equipped with what was - for the time - a sophisticated on-board computer that did much of the routine work of flying the spacecraft. During all but the final moments of the approach, flying the proper trajectory was a matter of analyzing navigation data from inertial and radar systems and then subtly adjusting the thrust and pointing of the LM engine. It was a labor-intensive task and a job well suited to computer control. Not until after an event called pitchover - when the spacecraft rotated from 60 degrees off vertical to 20 degrees - did the astronauts' roles become more than that of monitor-and-backup. Several times during the descent, the computer flashed alarms. The trajectory looked good but the "1202" message - like a later "1201" - wasn't one that the crew recognized and there were a few tense seconds until Houston radioed "We're GO on that alarm." As it turned out, parts of the computer memory were being overloaded with extraneous data from the rendezvous radar and, fortunately, not only had the computer been programmed so that it could continue to handle high priority tasks but, also, the person who knew the computer best - engineer Steven Bales - needed only a few seconds to diagnose the problem and recommend that the landing continue. Bales later stood beside the crew at a White House ceremony and was decorated for his singular contribution to the success of the mission. The on-board computer handled a variety of tasks during the descent and, in addition to the unanticipated flood of data from the radar, there were also annoying, computer-related losses in communications with Earth. The LM was equipped with a pair of broad-beam, "omni-directional" antennas, but a high rate of data transmission could be achieved only through use of a narrow-beam, steerable antenna. It was the computer's job to maintain proper spacecraft orientation so that the high-gain antenna could maintain a lock on Earth. The computer had been instructed to avoid certain spacecraft orientations which would force the antenna to look through the LM and, thereby, lose enough signal strength that the "lock" on Earth would be lost. However, the computer had been given an inaccurate "map" of the LM and loss of signal was a recurring problem throughout the descent. Because the precise landing spot was not critical on this first mission, all that Houston needed was enough information to be sure that the spacecraft was operating properly and, through the combined use of the omni antennas and voice relays through Collins in the Command Module, adequate communications was maintained. The program alarms and the communications dropouts were annoying but in all other respects, the LM computer and the navigation system performed beautifully. 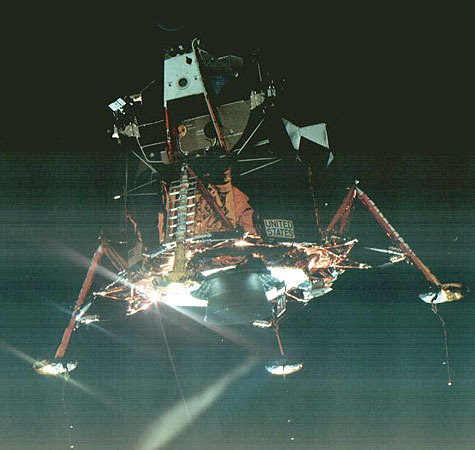 Eight minutes and thirty seconds into the burn, the computer pitched the LM nearly upright and Armstrong got his first close-up view of the place to which the computer was taking them. He was about 5,000 feet above and about 20,000 feet east of it. As planned, he had fuel enough for five more minutes of flight. Each of the astronauts had a small, double-paned, triangular window in front of him. On the inner surface of each pane in Armstrong's window, there was a long vertical scale marked in degrees and, at right angles to it, a similar but shorter horizontal scale. At pitchover, Armstrong positioned himself so that the vertical scales were aligned; and Aldrin read a computer output to him that indicated just where he should look on the scale to find the computer's intended landing point. In principle, if he didn't like the spot, he could pulse the pistol-grip handcontroller forward or back or to either side and, thereby tell the computer to move the target a small amount in the indicated direction. According to plan, Aldrin was to give Armstrong an "angle" every few seconds until, at an altitude of about five hundred feet, the window targeting lost its usefulness and Armstrong took over complete manual control for the final descent. However, once Aldrin had given him an initial target angle, Armstrong realized that, although the site selection team had picked a smooth patch of ground, the state of the guidance art at the time of Apollo 11 wasn't nearly as refined as it would be for the later missions, and fate and the computer were taking the LM into a field of boulders on the northeast shoulder of a crater the size of a football field. Nowhere on the Moon are craters of that size more than a few kilometers apart and, for this first landing, the NASA flight engineers were not yet ready to fine-tune the approach trajectory to much better than about eight kilometers east or west of the target point and about two kilometers north or south. The Apollo 11 "landing ellipse" contains dozens of craters a hundred meters across or more, and the important point is that the LM had enough maneuverability and propellant so that Armstrong could avoid even the largest of them. Even with the computers to help, landing a LM was a tricky operation, one that required countless hours of training in indoor simulators and in an ungainly "flying bedstead" called - more formally - the Lunar Landing Training Vehicle. According to Cernan, the LLTV was actually harder to fly than the LM. It was equipped with a big jet engine which provided enough thrust to counteract 5/6th of the pull of Earth's gravity and that big engine - firing more or less straight down - made the trainer more unstable than the LM. Indeed, during training, Armstrong had to eject from one of the LLTV's. His was the second of three trainers that went unstable and crashed and, as Cernan relates, the trainer he flew in preparation for Apollo 17 was the only surviving LLTV of an original fleet of four. The long hours of training paid off, of course. While Armstrong flew the LM toward a good landing spot, his attention was totally focused on the job at hand. Aldrin did virtually all the talking; and he, too, was all business. He read the computer output to Armstrong, giving him their altitude, their rate of descent and their forward speed. Back in Houston, Flight Director Gene Kranz and other members of the support team in the Mission Control Room were watching telemetry from the LM. They did not know about the crater yet - Armstrong wouldn't discuss it until well after the landing - but it was obvious that the landing was taking longer than planned. Indeed, with each passing second there was mounting concern about how much fuel remained. Because of uncertainties in both the gauges in the tanks and the estimates that could be made from telemetry data on the engine firing, the amount of time remaining until the fuel ran out was uncertain by about 20 seconds. If they got too low, Kranz would have to order an abort. Drama was the last thing that any one had wanted for the first landing. The event itself was exciting enough. Finally, Armstrong found a place that he liked and he began to kill his forward velocity and let the LM ease down toward the surface. As they came down through 75 feet, Duke radioed that they had sixty seconds of fuel left and, in the cabin, Aldrin had already seen a warning light that was telling him the same thing. But they were close now and it was just a matter of easing themselves down. Armstrong had killed almost all of their forward velocity and now, as they began to kick up dust with the engine exhaust, he asked Aldrin to confirm that they were still moving forward a little. He wanted to land on the surface he could see in front of them, rather than on ground he couldn't see behind them. Aldrin gave him the confirmation that he wanted and, eight seconds later, they saw the contact light. The sixty-eight-inch-long probes that dangled from the landing gear had touched the Moon. A second or two later they were down and had the engine shut off. Forty seconds had passed since the sixty-second warning, but they were down. Despite the drama of the moment and the enormous feelings of elation and relief that they both felt, Armstrong and Aldrin had little time for anything but getting the LM ready for an immediate departure. No one expected that they would have to launch right away but, just in case a problem did develop - say a leak of the high pressure helium that they would use to pressurize the propellant tanks in the Ascent Stage, they wanted to be ready. However, despite being very busy with things in the spacecraft for nearly two hours after they landed, from time to time they stole glances out the window and described the scene for the radio audience back on Earth. In all directions, the land was West Texas flat. The circular horizon was broken here and there by the subtle rims of distant craters. In the middle distance, Armstrong and Aldrin could see boulders and ridges, some of the latter perhaps 20 or 30 feet high. Close at hand, a hodgepodge of craters pockmarked the surface; and there were small rocks and pebbles scattered everywhere. It was a flat, level site but, as with Australia's Nullarbor (Latin for "Treeless") Plain, small variations gave the surroundings a subtle beauty of its own. And, of course, because this was the very first landing on the Moon, everything was of enormous interest. However, before Armstrong and Aldrin could pay much attention to the view or think about going outside themselves, they had to be sure that they had a healthy spacecraft and that the navigation computer was properly loaded with the information needed to get them back to orbit for a rendezvous with Collins. Finally, two hours after the landing, they and the NASA engineers were satisfied that the LM was ready to come home and, therefore, that it was safe to stay for a while. According to the flight plan, Armstrong and Aldrin were scheduled to take a five-hour rest break before getting ready to go outside. However, it came as no surprise when they suggested to Houston that, after a scheduled hour-long meal, they prepare for what was called, in the NASA jargon, an EVA - a period of Extravehicular Activity. Normally, the EVA preps were supposed to take about two hours but, because this was to be the shortest of the Apollo EVAs no one -except, perhaps, the waiting, worldwide TV audience - was bothered when the EVA preps actually took three and a half hours. Finally, about six and a half hours after the landing, they had the hatch open and Armstrong crawled out onto the porch - feet first and on his hands and knees. Moments later he was on the top rung of the ladder and pulled a lanyard to release a workbench/stowage area that was attached to the side of the LM. 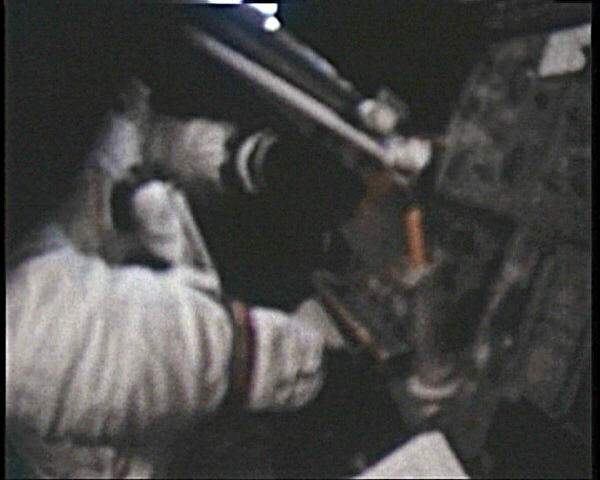 The Modular Equipment Storage Assembly or MESA was pivoted at the bottom so that, when Armstrong pulled the lanyard, the MESA swung down into a horizontal position. The most important piece of gear on it was undoubtedly the black-and-white TV camera. It was mounted in such a way that, when the MESA swung down, the camera was pointed directly at the foot of the ladder. For the astronauts, the landing had been the big moment of the mission. But, for the waiting world, the big moment was still to come - the first footstep. From the bottom rung of the ladder, Armstrong had to make a three-foot jump down to the footpad - a contingency against a less than gentle landing that might have compressed and shortened the landing strut. From the footpad, he had only a couple of inches to step down to the surface itself. He stood on the pad for a moment or two, testing the soil with the tip of his boot before he made the epochal "small step". The soil was very fine grained and had a powdery appearance and, once he stepped down, his boot sank perhaps a couple of inches, making a sharply defined print. Because of the Moon's relatively weak gravity field (one-sixth as strong as Earth's), Armstrong's total weight - half astronaut, half suit and backpack - was only about sixty pounds. Movement wasn't particularly tiring but because of the dramatic upward-shift in his center of mass caused by the backpack, he had to lean forward to keep his balance and it took a few minutes before he could walk comfortably. Just in case he had to end the EVA suddenly, Armstrong used a long-handed tool called the Contingency Sampler to scoop up a bit of rock and soil into a Teflon bag. He then removed the bag from the Sampler, folded it, and stored it in a strap-on thigh pocket. Aldrin joined Armstrong out on the surface about fifteen minutes later and then, for the next hour and forty minutes, the two of them examined the LM, moved the TV camera out about 50 feet, deployed a pair of scientific instruments, and collected more samples. One important set of questions to be addressed, of course, concerned the crew's ability to get the work done. If all went well, following crews could stay longer on the Moon, venture farther from the LM, and undertake more ambitious sets of tasks. For the first half hour or so, neither Armstrong nor Aldrin did more than a shuffling walk as they went about their work and it was planned, after this initial period of familiarization, for Aldrin to try to take advantage of the one-sixth gravity and try to run. Starting from near the LM, he first ran toward the TV camera, rolling from foot to foot in a loping or, as Jack Schmitt calls it, a cross-country skiing stride. Then as he turned and ran back toward the LM, he used the same gait again but twice changed direction by sticking a foot out to the side and pushing off of it, rather like an American football running back. Coming back toward the camera for a second time, he tried a kangaroo hop but decided that it didn't give him as much fore/aft stability as he got with the loping gait. It looked as though a crew that ventured a few hundred meters away from their LM would be able to run back in just a few minutes if the need arose. In general, the crew of Apollo 11 went about their work with appropriate caution. However, as with later crews, as time passed, their confidence grew. Generally, they walked without bounding and, compared with later crews, their movements seem fairly stiff and restricted. However, toward the end of the EVA, the TV audience got a glimpse of Armstrong running back from a brief visit to a crater 60 meters east of the spacecraft. There was even one moment - a bit earlier in the EVA when Aldrin was lifting the scientific instruments down from its storage compartment - when Armstrong appeared to bob down on one knee, a difficult maneuver in the stiff spacesuit. Clearly, it was possible to get work done and to move with relative ease. Later crews would have more time to adapt and, building on the Apollo 11 experience, would do their work with greater and greater confidence. With only a short time at their disposal, Armstrong and Aldrin had only a few things they could get done before they had to have the hatch closed. They raised an American Flag, deployed a solar wind collector, gathered forty-seven pounds of samples, and carried a laser reflector and the passive seismometer about twenty meters south of the LM for deployment. They hammered two, short core tubes into the soil, took about one hundred color photographs, and, finally, got themselves and the samples back into the spacecraft. Because of the restrictions imposed by the pressurized suits, by the shifted center of mass, by the weak gravitational field, and especially by the clumsy, pressurized gloves, the work was generally harder to do than it would have been in a shirtsleeve environment. Compared with later missions, the suite of scientific gear that Armstrong and Aldrin deployed was quite modest and, as Jack Schmitt told the story during our review of this Apollo 11 summary, at least part of the reason was a concern over fuel margins. "There was lots of discussion about it. I mean, at that same time, some people were saying 'Well, maybe we ought to just have one guy go out on an umbilical; it's too dangerous.' Slayton wanted a buddy system -two guys going out with backpacks - and I was supporting him on that and I got into a lot of arguments. God, the kinds of things we went through to finally get there. And, at the same time, Buzz Aldrin was trying to get to be the first guy to go out. (Laughing) He had me working on some scheme to figure out how in the world we could justify having him and Armstrong switch places in the LM after landing. God! Anyway, in putting together the Lunar Surface EVA Operations Planning Book for the PSAC - which was the first time anybody tried to do a detailed timeline for two EVAs - it became increasingly obvious - when you put it in light of the problems the LM was having in terms of weight and everything - that the chances of 300 plus pounds of ALSEP flying were pretty small. So, in my draft charts before the final briefing, I included some issues that had to be addressed. And one of them was: do we need a contingency ALSEP? What were the two experiments that you'd like to have on the Moon if you never got another chance? And, very quickly, it was obvious what those were. One was the seismometer and one was the corner reflector. And so I had this on my draft charts." "We did a dry run with the JSC management before giving it to PSAC. And, when that chart came up Bill (Wilmot) Hess just went ballistic! He wouldn't hear of not flying the ALSEP. I mean, the guy just lost it. And everybody was just sort of staring at him. He was Science Director and he just couldn't control himself. I don't think he's ever forgiven me for doing that. But the judgment of Bob Gilruth and George Low was 'It makes sense, so let's go to work.' Basically, we had six months - I think it was - to get it ready. It would be solar powered and lightweight. I don't remember how much it weighed. And Bill Hess was absolutely convinced - and was right - that, as soon as the contingency package existed, they'd take the ALSEP off of Apollo 11. Well, my position was that they were going to do that anyway and, if you didn't have something, you weren't going to get anything. God, we went around and around on that. But that's why Apollo 11 didn't have ALSEP but did have some science experiments." Weight limitations were certainly one reason why Apollo 11 flew with only a few pieces of scientific gear. Another was the simple fact that, on this first landing, it was unlikely that NASA management would have approved an EVA long enough to allow the astronauts to deploy a complete ALSEP. On the Apollos 12 and 14, the ALSEP deployment typically took most of the first four-hour EVA and, as the first crew to do a lunar EVA, it seems unlikely that Armstrong and Aldrin would have been allowed to stay out that long. As Cernan suggests in his Apollo 17 commentary, in any particular set of circumstances, there is always a best way to get a job done. Although Armstrong and Aldrin didn't have time to discover many of the tricks of getting work done efficiently under lunar conditions - and didn't have the experiences of prior crews to guide them - the EVA went smoothly. That success can be ascribed readily to forethought, to careful training, and to a measure of justified caution on this first lunar visit. The only significant problem that they encountered came when Aldrin tried to drive the core tubes into the soil. Despite hammering hard enough to actually dent an extension handle attached to the top of the tubes, on both attempts Aldrin only managed to drive the tubes about 8 to 9 inches into the ground. In hindsight, the cause of Buzz's troubles was the fact that, more than a few inches below the surface, lunar soil is almost perfectly compacted, a circumstance that had not been anticipated. The core tubes were of a fairly standard design which included an internal bevel to provide some compaction of the entering soil so that it wouldn't promptly fall out. Because the lunar soil was already very compact, it simply couldn't be forced into a standard tube and it was impossible for Buzz to drive one more than a few inches deep. What was probably the least efficient work that either Armstrong or Aldrin did came during the final minutes when Armstrong used a piece of equipment called the Lunar Equipment Conveyor or LEC to get the rock boxes - one at a time - up to Aldrin in the cabin. Essentially, it was a clothesline. After Aldrin hooked the LEC to a pulley in the cabin, Armstrong hooked one of the rock box to the LEC, backed away from the LM to make the line taut, and then pulled hand-over-hand as the box bounced its way up to Aldrin. It was hard work. At the start of the EVA, Armstrong's heart rate had been about 120 beats per minute and it had declined more or less steadily toward a low of about 80 as he took pictures at the rim of Little West Crate,east of the spacecraft. With time running short, he began a hurried collection of rocks and soil and his heart rate climbed to the 120-140 beat range. And then, while he was using the LEC to get the rock boxes up to the cabin, his heart rate shot up to 160 beats per minute and Houston had to call for a short rest. Other Apollo Commanders didn't have to work quite so hard when they were using the LEC. The excitement of the moment and the rush of collecting the bulk sample surely were contributing factors in Armstrong's case. But the LEC was an inefficient tool and, beginning with Apollo 14, the astronauts started carrying at least some of their gear up to the cabin by hand. The 16 and 17 crews did away with the clothesline LEC entirely - having decided that it was more trouble than it was worth - and hand carried everything except a bag containing their camera. That bag they raised and lowered with a hook and lanyard, a humble rope that somehow managed to inherit the LEC's name. Two hours and thirty one minutes after they first opened the hatch, Armstrong and Aldrin reported it closed again. There were still five hours to go before Houston said "Good Night" and there was still plenty to do. There were samples to stow, gear to be jettisoned, and a long list of housekeeping tasks to be taken care of before they could have a scheduled rest period. 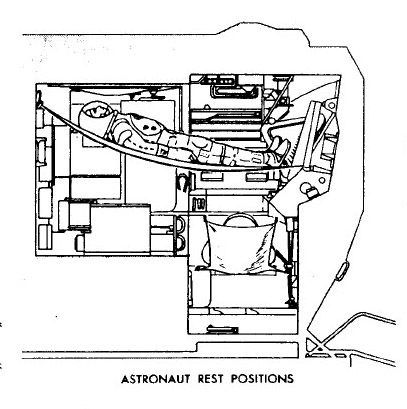 They slept in their suits - or tried to - with Aldrin curled up on the floor and Armstrong propped up on the ascent engine cover in the rear of the cabin. The rest period was, they said, "almost a complete loss." They were bothered by spacecraft noises and by sunlight leaking around the edges of the window shades and in through the sextant. They were cold and damp in the suits and, of course, they were really too excited to sleep. For Apollo 12 and subsequent flight, the crews did not connect their Liquid Cooled Garments to the Environmental Control System after getting back in the cabin after an EVA and reversed the direction of air flow in the suits so that fresh air came in through the torso , rather than the helmet. These two changes took care of the temperature problem; but it wasn't until Apollo 15 did anyone really get any sleep on the Moon. From Apollo 12 onward, the crews hammocks they could lie in. However, it wasn't until Apollo 15 that the lunar stays were long enough - and the astronauts and mission planners had confidence enough - that the crews got out of their suits during the rest periods and, with the help of earplugs to cut down on the noise, really got some sleep. Aldrin may have gotten two hours of fitful sleep. Armstrong got none at all. For seven hours Houston left them alone with their thoughts. Then it was time to wake up, have a quick breakfast, and get ready for the launch, the rendezvous with Collins, and the heroes' welcome awaiting them at home. If, from a practical point of view, Apollo 11 was a demonstration flight, a point of departure for the more sophisticated missions that would follow, it was still the one for the history books. The other crews would work in relative obscurity, stepping briefly into the spotlight but without leaving so lasting a public impression. There would never be anything quite like making that first footprint on another world but then, too, there was still a long way to go before humanity could claim to be more than temporary visitors to the Moon.